You are going to think I am soooo spoiled... and I am. Yes, my husband the "Artisan Bread Baker" made the Fougasse for me last week, and this week my 10 year old daughter the "Amazing Pastry Chef" made the tart. We all have our specialities in the Balch Family. I am the "Savory Everyday Cook" and my son well, he's just in charge of eating. You see he is officially a teenager today, and we all know how much teenagers need to eat. He was fortunate to get this tart on his actual birthday since his sister already baked him a double chocolate ganache filled cake for his party this past weekend. So what did we think of the tart... loved it. The contrast between the bitterness of the chocolate and the sweetness of the caramelized bananas and apricot glaze had our tastebuds dancing. The chef ate two pieces she loved it so much, sorry I can't include a picture of her enjoying the tart but her copyright fees are outrageous. Criticisms were minimal our issues were more preferences than real problems with the recipe. It wasn't clearly stated if the tart should be served chilled, so we let it warm to room temperature which I think was a mistake. I would have preferred the ganache to be firmer, so eating it directly from the fridge would have been better. Dorie also had the largest bananas I've ever seen... because one caramelized banana was not enough to cover the bottom of the tart, and it took not two but six bananas to decorate the top. We all agree the best part was the crust... it was heavenly shortbread and I could have eaten it alone. Salted Caramel Chocolate Tarts and a very sweet Mother's Day. you had me at double chocolate! This looks so yummy! 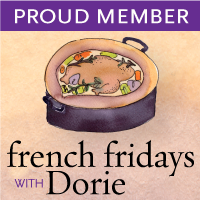 I have a food party on Friday so I have to do the cooking for Friday with Dorie earlier in the week. My daughter had 2, but she was the baker. She deserved it. Love that your 10 year old daughter made this beautiful tart! I do too, and it made me really realize that she has talent. So impressed that your 10 year old made this tart! It is gorgeous! In ten years you'll have to look for her pastry shop. Your girl did a lovely job. LOL, WHERE DID SHE GET HER BANANAS? Maybe we shouldn't asks such probing questions we might get into trouble. The greatest chefs are still male... so there is some hope for your boys and cooking. Remember expectation is everything. Wow, your daughter is an amazing pastry chef! What a beautiful tart. I'm so glad that everyone enjoyed it. Happy Birthday to your son. I'm thinking when she is a little older that maybe she can start a business. Something small like making birthday cakes to order. What a talented family!!! And hey, someone needs to help eating all of those delicious recipes! Your (daughter's) tart is simply lovely. Happy that you all enjoyed it so much. I missed out on the bananas as I made the Nutella hazelnut version. Yummy. Thank you, I aways send we should open a restaurant... who knows what the future holds. My son loves Nutella, unfortunately my daughter has nut allergies. Lovely, your daughter did a fantastic job. This was a really good recipe that will be used time and time again. Your daughter did an impressive job! I didn't even think the reason there wasn't enough caramelized bananas was their size, but it's obvious now that you mention it. 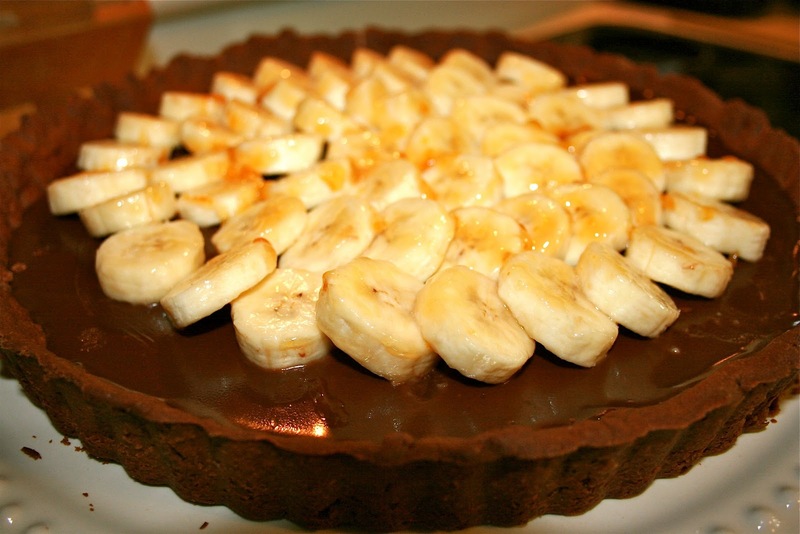 I loved that component so much I could see just making a tart with them, though LOTS of bananas would be required. Have a great weekend. I think it's wonderful that everyone enjoys cooking and eating in your family. Well done with the tart!!! Diane, The best family memories, I think, are around the table (food and game). My kids talk a lot about the meals I cooked for special occasions or the bunny cakes at Easter or the alligator-shaped bread as well as Colonel Mustard and the candlestick and what Scrabble words were never really words. It appears as if your family is the same only my kids never baked! Wow, that was some tart and don't ytou love that she has a passion.Probaboy she has lots of them. The tart looked beautiful and I enjoy reading about your family. You sound like you are coming from the same place as me. I have a lot of memories connected to cooking and food... both sides of my family are from Italy how could I not. We go up to the Adirondack Mountains, NY every summer and we cook, eat and play board games. My kids are really into Settlers of Catan and a new game called Cargo Noir. Congrats to daughter on her tart! I agree, the banana count was way off! Your daughter made the most beautiful job of this tart - it looks very professional! The flavours sound fabulous - this is a really mouthwatering post! You really should check out the cookbook it is beautiful with amazing recipes in it.